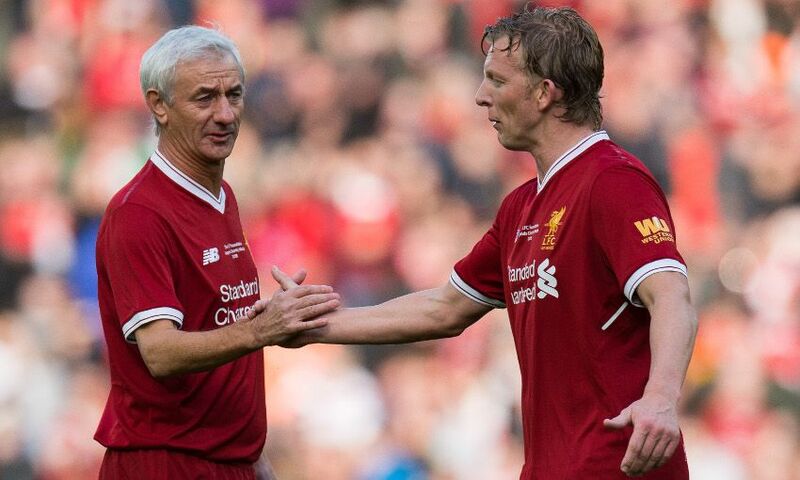 Dirk Kuyt could barely hide his delight after scoring once again in a Liverpool shirt as the Legends drew 5-5 with Bayern Munich yesterday. But the Dutchman admitted he had one gripe with his afternoon's work: namely that the Reds couldn't find a decisive 11th goal to cap a memorable afternoon with a win. Kuyt set the tone for a goal-laden first half as he nodded in Michael Owen's cross after just five minutes and went on to play the full game on his return to Anfield. He was, however, left rueing the linesman's decision to correctly rule out a late Luis Garcia winner after Steven Gerrard hit the frame of the goal. Kuyt told Liverpoolfc.com: "I think it was the first chance of the game. I took it on my head, nice goal. "It's nice to be back at Anfield and scoring [in front of] a good crowd, for a great cause, [I'm] so very happy. "The only thing that we should have done is win the match. We were close, but I think Luis was just slightly offside [for his late goal]. "But like I said we enjoyed it. It was a great game and to come back from behind was good. The crowd were behind us and we almost made it 6-5." The 37-year-old, who played his final game for Feyenoord only last year, also hailed the 'amazing' experience of linking up with familiar faces again to raise vital funds for the LFC Foundation. "I had an amazing weekend. I came here Thursday in the morning, yesterday I played golf with some of the lads," he added. "Today, we were together in the hotel, we had a pre-match meal, we had a meeting and in the dressing room; that's the biggest thing you miss in football because they are the best moments. "We are going to enjoy this weekend. We gave everything, so now it's time for a little drink."